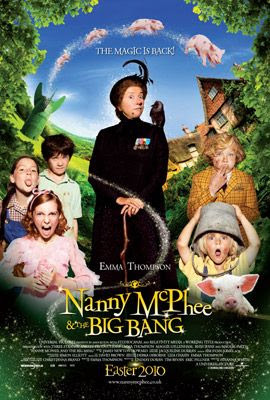 I really enjoyed the first Nanny McPhee (which happens to be one of the first movies I ever rated on IMDB), and I was pretty surprised when I found out about Nanny McPhee and the Big Bang. But, as I thought it would be, the second installment is just as fun as the first, but unfortunately lacks the magic that the other one had. Nanny McPhee (Emma Thompson) comes to the aid of a harried young mother, Mrs. Green (Maggie Gyllenhaal). Her husband is away fighting at war and she has just received couple of rich kids from the city to look after, in addition to her family. The house seems in a shambles, but with Nanny McPhee's help, everything may just go back to normal...for a little while. This movie comes as a breath of fresh air. We are stuck in a rut where all the family movies have to be about talking animals so they don't put anything to over the top of little kids heads. Yes, this film does have some animals doing some abnormal stuff, but it isn't stupid. Aside from being extremely entertaining, it has some heart as well. Which is pretty rare, come to think of it. However, I just didn't find it as magical as the first film. I think that is because we know what Nanny is all about, so her character offers no surprises as she did before. That kinda took the great factor out of it. I think it was pretty good that the sequel was made, and I won't go hating on it. Because I really do enjoy these types of films which remind me of my childhood. Compared to the CGI animal garbage that seems to be in every single family film coming out. And it has a great performance from Maggie Gyllenhaal, who serves as most of the films heart. A charming movie, just not a patch on the first.